The web site Media Bias/Fact Check gives a right-wing rating to the Canadian online magazine The Post Millennial, but I didn't have to check that site to know it - the fact that The Post Millennial decided to praise the Quillette/IDW/Rebel Media gang for mobbing a Canadian academic for an innocuous tweet immediately told me where they stood. And as I mentioned a few days ago, Barbara Kay, the mother of Quillette editor Jonathan Kay, has written for it. 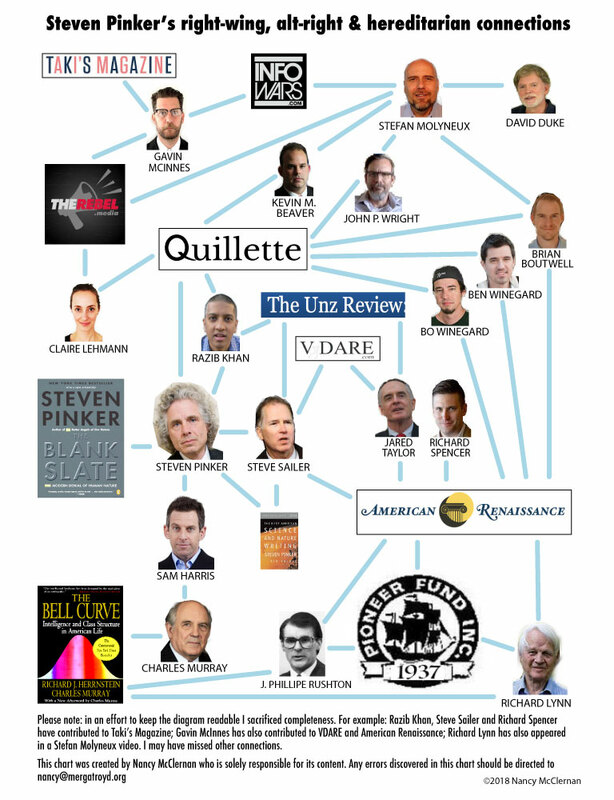 As I have discovered by taking note of all the Trump supporters who defend Quillette on Twitter, the right loves Quillette, which shouldn't be a surprise since Quillette's founder Claire Lehmann was a contributor to extreme right-wing Rebel Media. And based on Ezra Levant's joining in with her mob to go after the Canadian academic, I think they still keep in touch. As if joining the Q/I/R mob wasn't bad enough, Terry Newman went after me too. "There were no responses to these questions. This refusal to provide evidence for accusations is striking considering the number of likes and retweets these dehumanizing statements get on Twitter. So what’s happening here? Let’s explore." If you're reading this blog you know I have plenty of responses to those questions. There is also my extensive series on evo-psycho bros on my personal blog. But like the incompetent journalist that she is, Terry Newman never contacted me for the answers. First because I don't remember to follow up on every thread I comment on. And in this case I had no idea others had responded to my comment. Second because I had said what I wanted to say: that many Quillette articles are so congenial to white supremacists they are reprinted in American Renaissance. Now for some reason Twitter won't let me paste a link that demonstrates all the Quillette articles reprinted in American Renaissance which is why I didn't include it in my tweet. But it is 100% factually correct as you can see via this link. 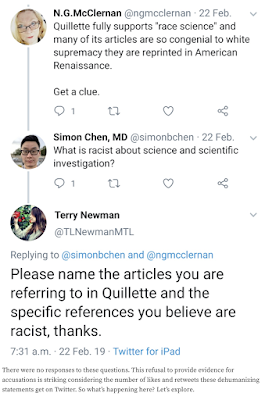 And how, exactly, is my empirically verifiable statement that Quillette supports race science and many of its articles are re-printed in American Renaissance an example of "dehumanization?" Once I found out I was being smeared by Terry Newman in the Post Millennial I went to the site and sent a protest via message form - to which I never received an answer. Then I tracked Newman down on Twitter and informed her that had she bothered to ask, I would indeed have responses to those questions. So when she demanded I provided them I did, immediately. Rather than reading them she responded that she wasn't going to read them and did I think she was my fan. And when I pointed out what a hypocritical weasel she was, she blocked me. 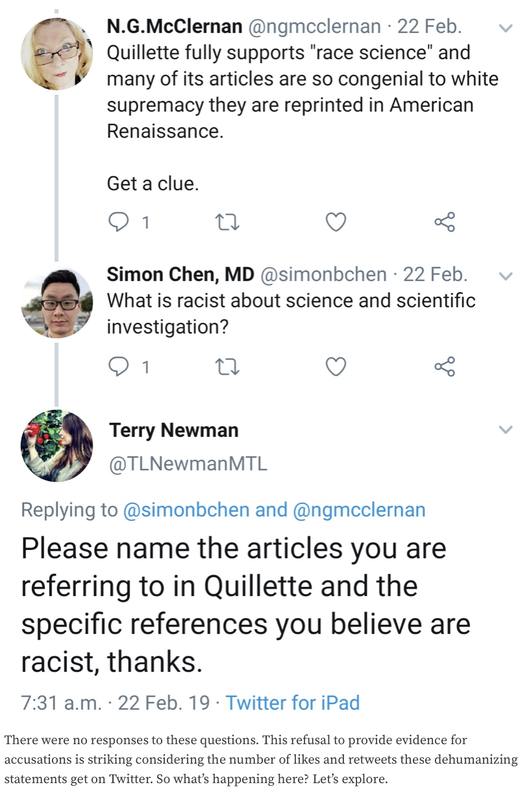 Standard Quillette/IDW/Rebel Media response. So to recap: Terry Newman wrote an article quoting my tweet, misrepresenting me as not having any responses without reaching out to ask me, and then when I tracked her down and gave her my responses she refused to read them. And in case you are wondering - yes of course, of course this ethics-deficient hack has written for Quillette.